If you are experiencing carryover issues also known as ‘Priming’ then we would advise you to speak to us for a free onsite consultation, our experts can perform a full water analysis report of your boiler, hotwell and make up water and discuss with you the best way to achieve efficient boiler water treatment and care, however in the mean time we can provide a chemical stopgap for reducing the risk of carryover. Some sites struggle to keep up with blowdown requirements and don’t fully understand the vicious circle that allowing carryover causes. As well as facilitating the corrosion and failure of plate heat exchangers (which in turn can allow for contamination of product and contamination of condensate return) allowing carryover will mean the return of very high TDS in your once pure condensate. High condensate TDS leads to high Feedwater TDS which in turn fails to dilute the TDS of the boiler sufficiently which in turn requires more blowdown to prevent further carryover – the cycle continues. 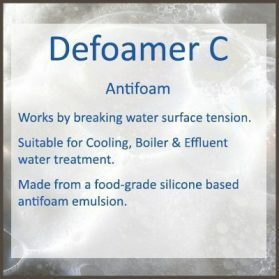 Introducing an antifoam such as Defoamer C will help to break the surface tension making it more difficult to create bubbles and foam by the use of its silicone based food grade chemistry. This may allow for the boiler to run at higher TDS without risk of carryover. For expert advice on preventing boiler carryover arrange a free onsite consultation with one of our experts. A boiler’ job is to generate steam, impurities within the feedwater which are not boiled off with the steam will remain present in the boiler water and increase in concentration. As concentration of the dissolved solids increases the foam bubbles tend to become more stable and less vulnerable, this helps to increase foaming as the agitation of the boiling water isn’t bursting the bubbles. The growing foam will eventually enter the steam space and be carried over with the steam. This means that the steam is very wet and carrying a high level of both dissolved and suspended solids which can contaminate steam traps, heat exchangers and control valves. Dry pure steam will not corrode but wet steam will, this is why carry over causes failures further down the line, this can be dangerous for operators working nearby and can also spoil product and cause the shutdown of production. Typical dosage rate for boiler water would be 1 – 5ppm which would translate as 1 – 5g of Defoamer C per metric ton of feedwater being treated, you may wish to mix this as a dilute solution with water when dosing. Your calculation should be that for every ton of softened water added to the feed 1 – 5g of Defoamer should be dosed. If site decides that a higher concentration needs to be added, it should be trialled at slowly increasing dosage rates. Over dosing could inhibit the effectiveness of other water treatment chemicals. 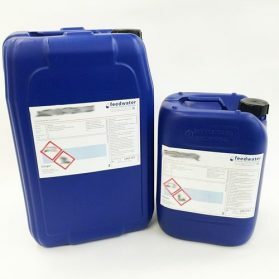 If you are interested in using Defoamer C it is now available to buy in our web shop on this website. If you would like a free consultation by one of our service consultants at your site to give advice on efficient boiler operation and how to prevent boiler carryover please contact us.